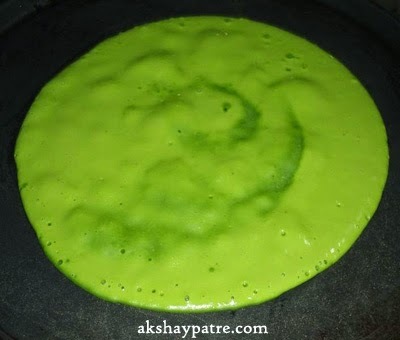 Saipe panna dose recipe - This is an authentic South Karnataka style sweet dosa, prepared with dill leaves, jaggery, rice and coconut. I have earlier posted sabbasige sihi idli recipe. 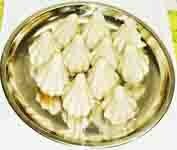 in it, I have used both rava or semolina and rice as a basic ingredients. But, in this dose, I have used only rice like the one in original traditional recipe. 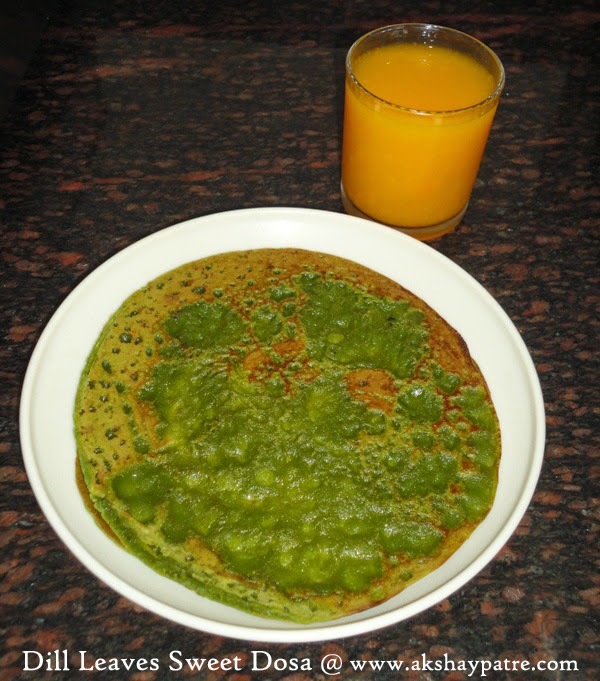 This sabbasige sihi dosa has superior dill flavor and unique taste in combination with coconut and jaggery. 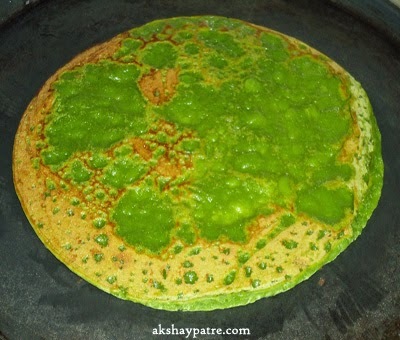 In order to achieve the full flavor of dill leaves, blend the batter just before preparing the dosa. Dill leaves are healthy leafy vegetable and it is extensively used in various Indian cuisines. Dill leaves are also used in making sabzis in combination with green gram dal, behgal gram dal, black eyed beans, green peas, toor dal, potato and carrot. However, the sabzi with moong dal is quite similar to methi ( fenugreek leaves ) moong dal sabzi. I will post the dill subzi recipes in due course. Dill has an abundant supply of dietary fibers which helps in digestion. Dill leaves contain good amounts of vitamin A,and vitamin C, as well as reasonable amounts of riboflavin. It is a good source of minerals like iron, calcium and potassium. Consumption of dishes prepared with dill leaves are great for bone health, since it contains good amounts of calcium. Dill leaves boost the immune system. It has antioxidant properties which helps in removal of toxins. Wash and soak the rice for 2 - 3 hours. Drain and keep it aside. Pluck the dill leaves from the hard and rough stems. Wash them thoroughly under running water to remove the soil or mud. Drain and chop them roughly. Combine together the rice, chopped dill leaves, grated fresh coconut and jaggery powder. Put them in a mixer and grind into a smooth paste, adding water gradually. Grind the batter into two batches and transfer it to a large vessel. Then add salt and mix well. Add water if required. Heat a griddle and apply 1/4 tsp of ghee or oil on it. Pour a ladle full of batter and spread it to a circular motion to make a round dosa. Cook covered on a medium flame till the base turns firm. Flip it and cook till the golden brown spot appears. Remove and serve the dill leaves dosa hot with ghee and choice of your drink. 1. Wash and soak the rice for 2 - 3 hours. Drain and keep it aside Separate the dill leaves from the hard and rough stems. Wash them thoroughly under running water to remove the soil or mud. Drain and chop them roughly. 2. Combine together the rice, chopped dill leaves, grated fresh coconut and jaggery powder. Put them in a mixer and grind into a smooth paste, adding water gradually. 3. Grind the batter into two batches and transfer it to a large vessel. Then add salt and mix well. Add water if required. 4. Heat a griddle and apply 1/4 tsp of ghee or oil on it. 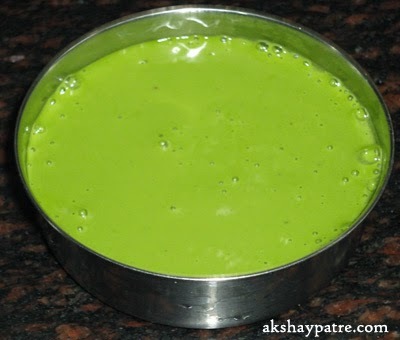 Pour a ladle full of batter and spread it to a circular motion to make a round dosa. Cook covered on a medium flame till the base turns firm. 5. Flip it and cook till the golden brown spot appears. 6. 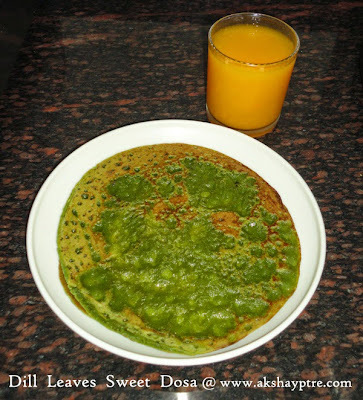 Remove and serve the dill leaves dosa hot with ghee and choice of your drink. wow! very healthy dosa. Never tried this. wow fantastic recipe and dill leaves sweet dosa sounds very interesting to me :) never have tried this combo :) looks very attractive dear !! Never tried this combo sounds very interesting..thanks for sharing..